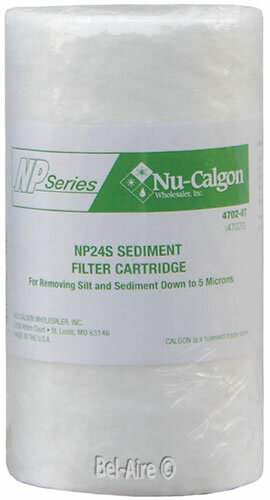 The NuCalgon NP24S Sediment Cartridge is composed of polypropylene that is manufactured by patented blown-microfiber technology. An additional pure polypropylene pre-filter provides exceptional dirt-holding capability with a long life, and fewer cartridge changes. The NP24S is designed to handle up to 200 gallons of water per day for six months. Rated at 5 microns with a very low pressure drop (i.e. 1/2 psi at 5.0 gpm). Made with FDA-approved materials. Model NP24S, Part Number 4702-87. Used in the NP24 Housing, not included.